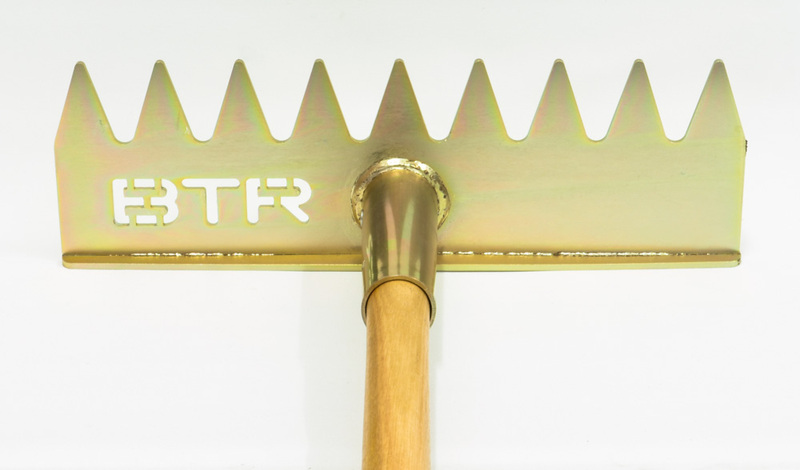 Taking inspiration from our Trail Tool, the Tough Rake is our evolution of the common rake. Prioritising versatility and durability, the Tough Rake is invaluable for clearing lines and moving soil, as well as smoothing and tamping down. Built for breaking up, moving and packing down soil, the Tough Rake comes into its own when building dirt jumps and trails. Its 40cm wide head takes the hard work out of dragging earth and sculpting contours. The teeth are aggressive enough to bite into and move packed soil, and the straight back creates smooth lines with ease. Once you’ve created the shape you want, the Tough Rake is strong enough to tamp down your creation. The Tough Rake is available with or without the handle, which can save you a stack on shipping costs. The ‘Head only – no handle’ option, does not include the wooden handle. The Tough Rake head will only fit a tapered handle; 40mm diameter at the end, tapering to 35mm diameter at the top of the collar (150mm from the end). These handles may not be readily available near you, so please check before you buy!